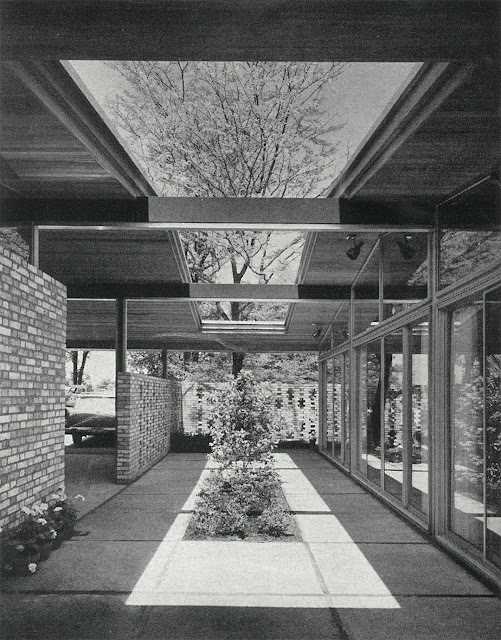 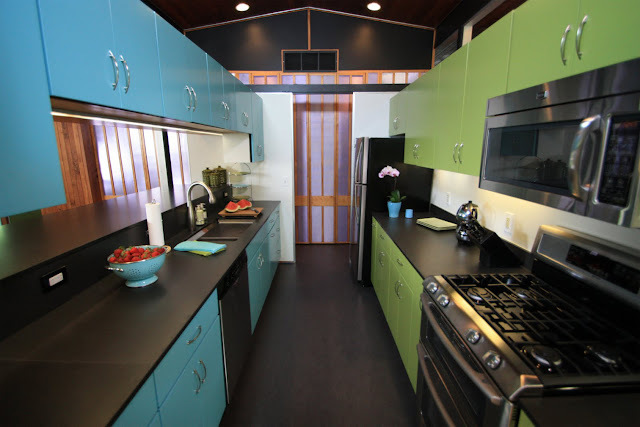 Alcoa hired prominent architect Charles M. Goodman to design the "Care-Free" home; the standard model had post and beam style construction with 1,900 square feet of living space and included 3 bedrooms and 2 baths. 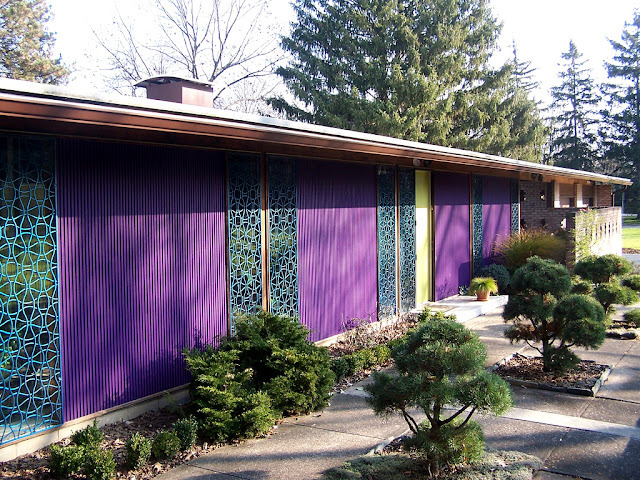 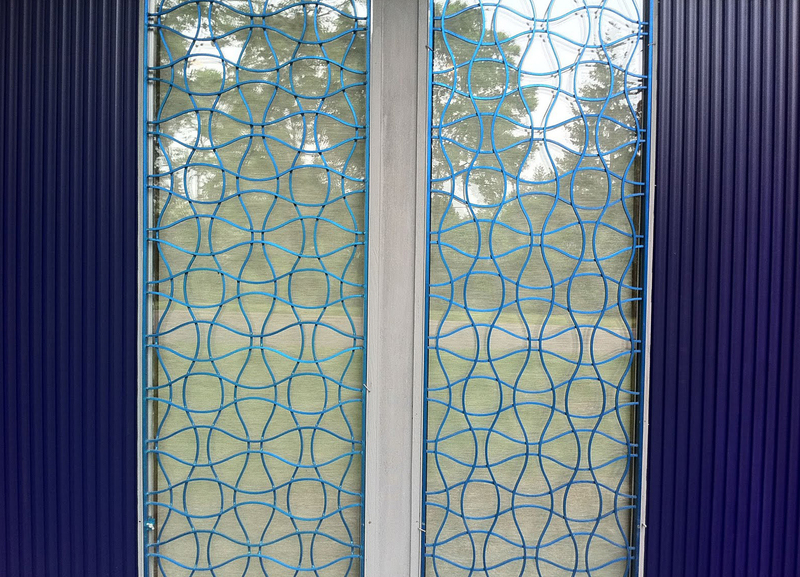 The design integrated the use of 7,500 lbs of colorful aluminum details throughout the house, including a sky-blue roof, gold front door and its signature purple siding and blue window grilles. 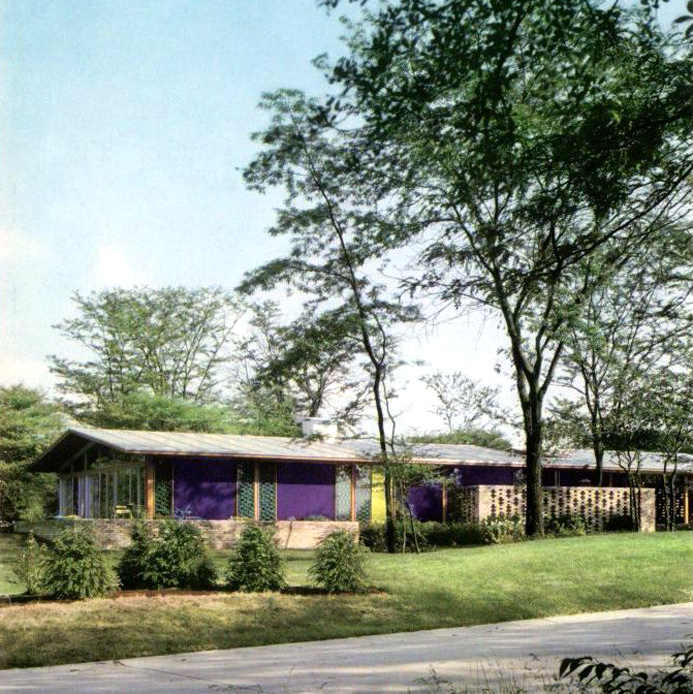 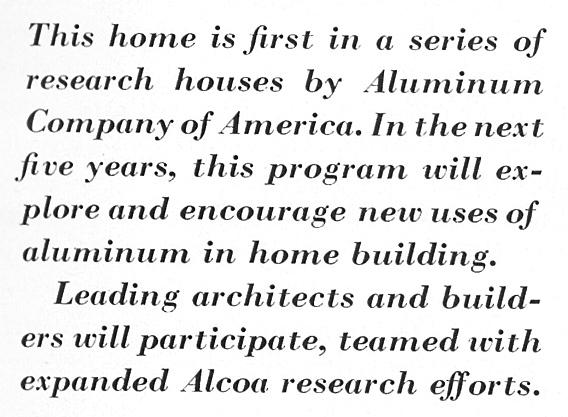 By the end of 1957 approximately 24 of the Alcoa "Care-Free" homes were completed across the US. 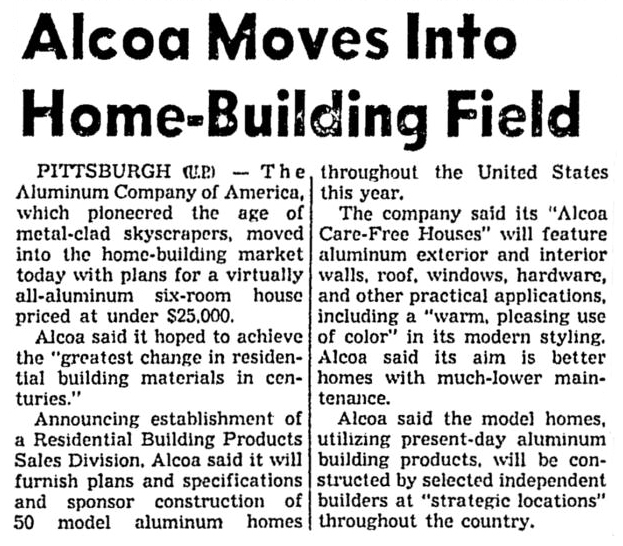 Unfortunately for Alcoa, they never made it to the planned 50 model homes; I have read conflicting information on how many were actually built, the lowest being 24 and the highest 46 (if anyone out there knows the for sure please let me know!). From what I could gather from my research, the final cost of the homes were much higher than expected, ranging from $35K to $60K, which I speculate led to the projects eventual demise. 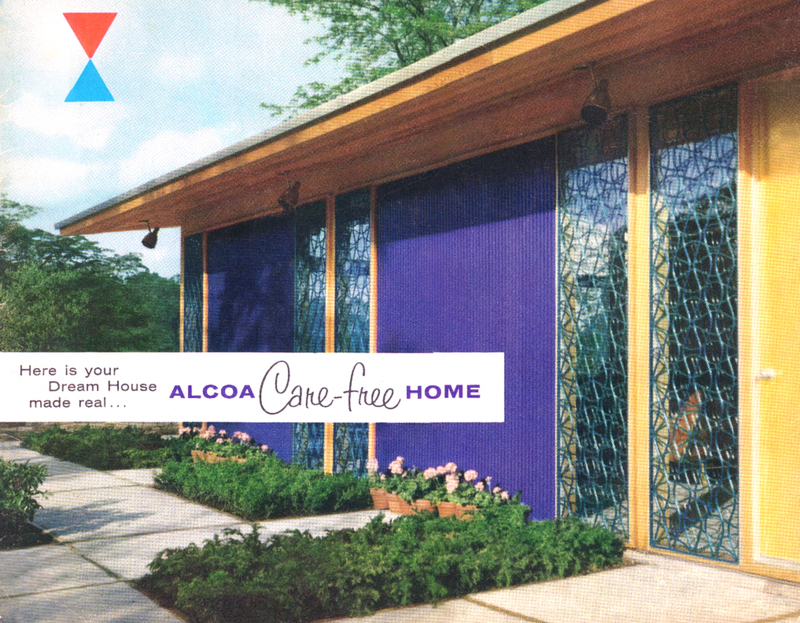 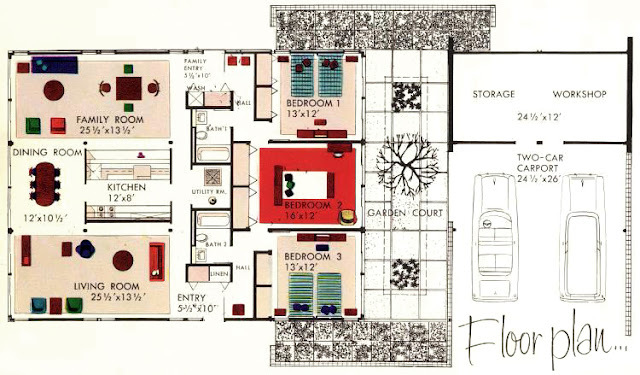 "You're about to take a pictorial tour through your dream house, now made real"
An Alcoa Care-Free model home was featured in the October 1957 issue of Better Homes and Gardens. 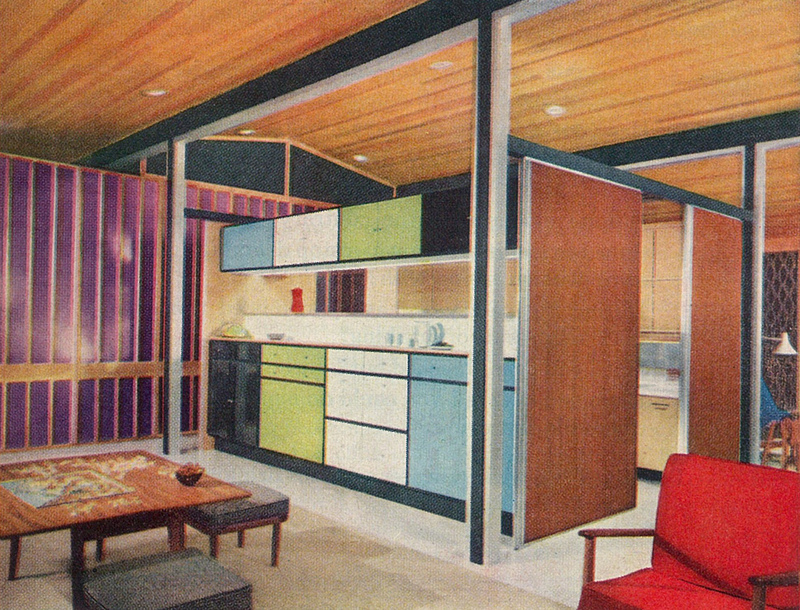 Below are some images from that article. 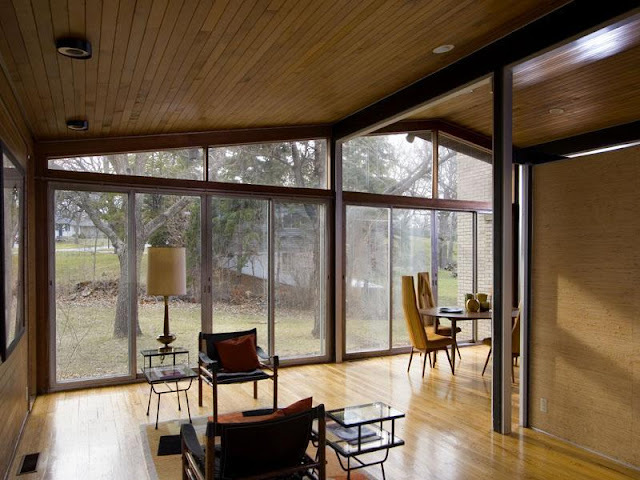 Below are images of the Alcoa aluminum home located in Brighton, NY, taken by the current home-owners who purchased the house in 2007 and began an extensive restoration project on the 50 year-old home. 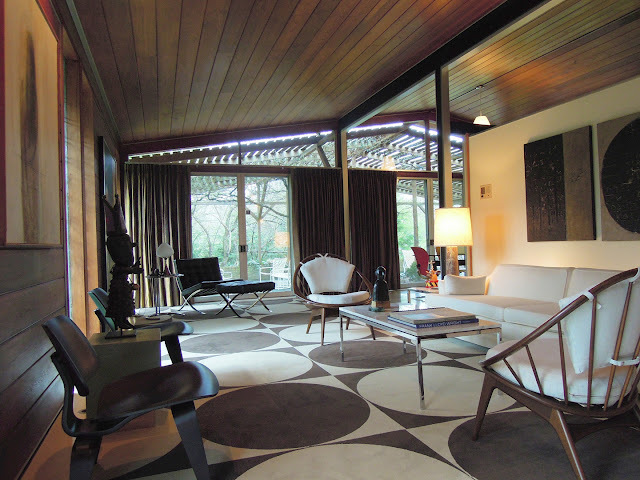 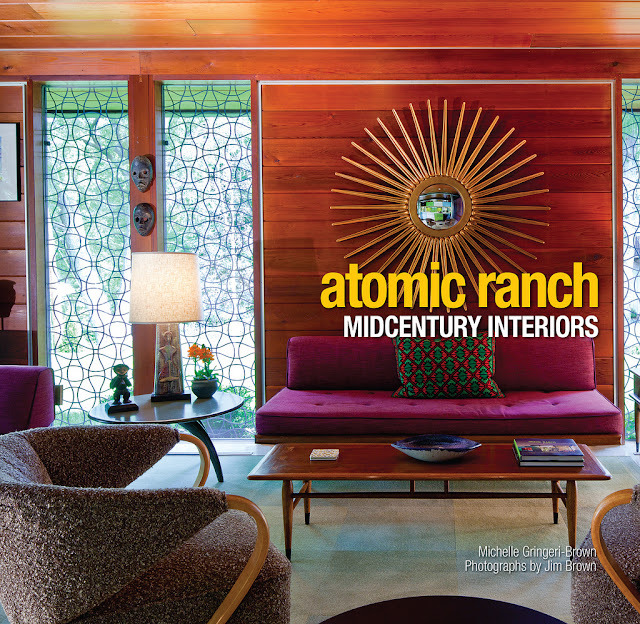 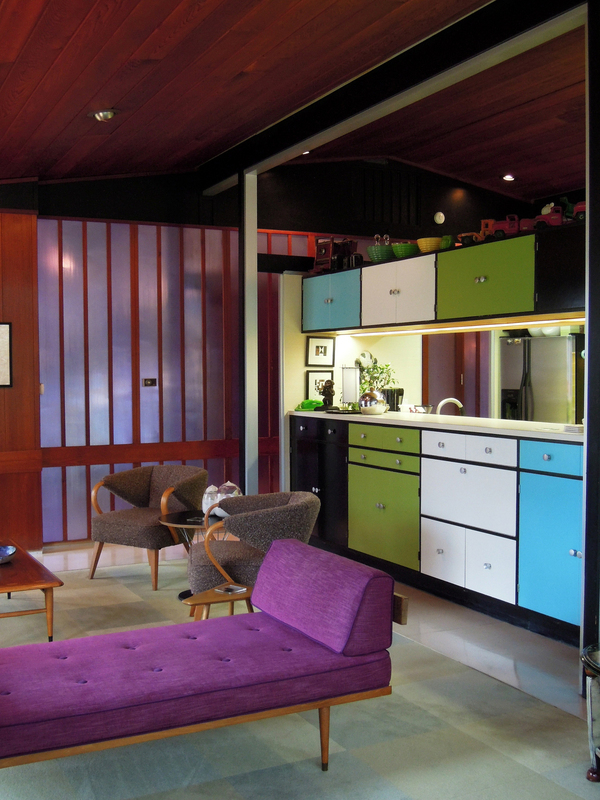 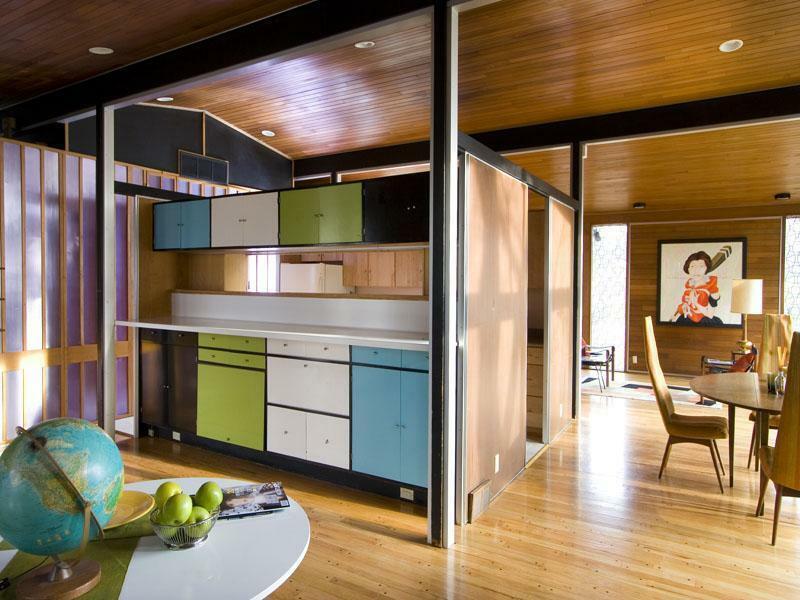 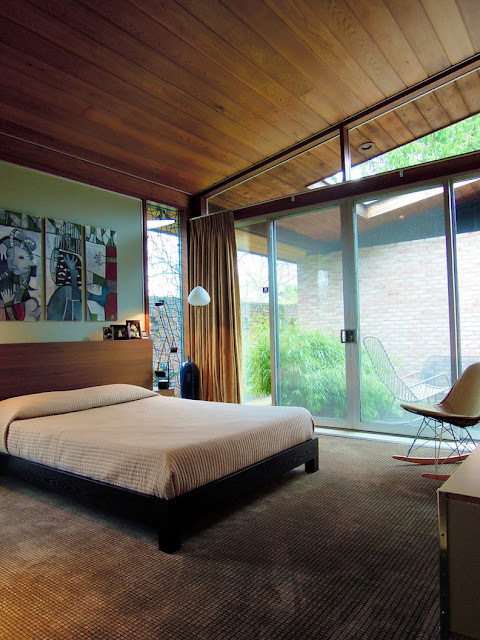 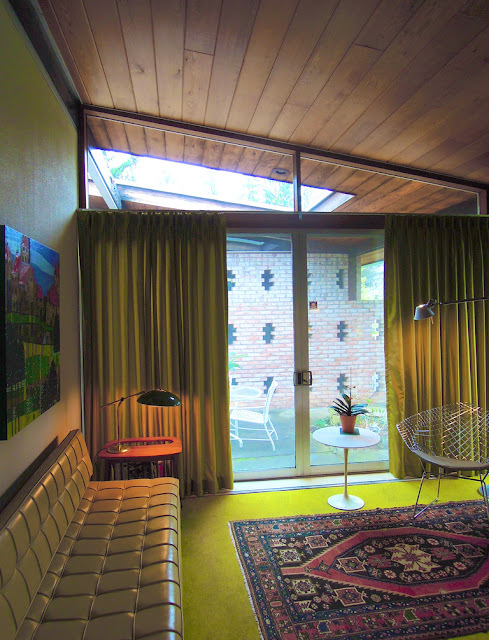 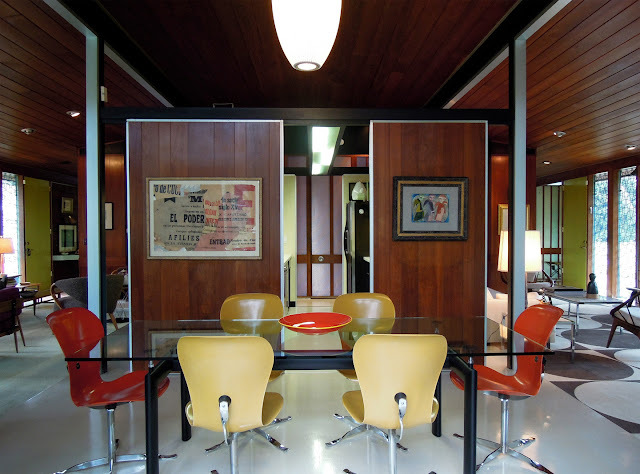 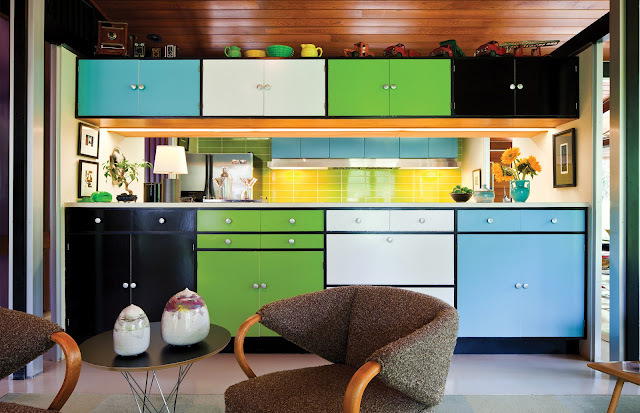 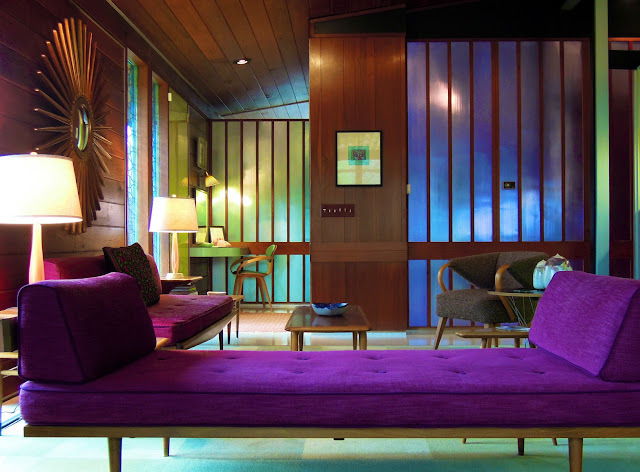 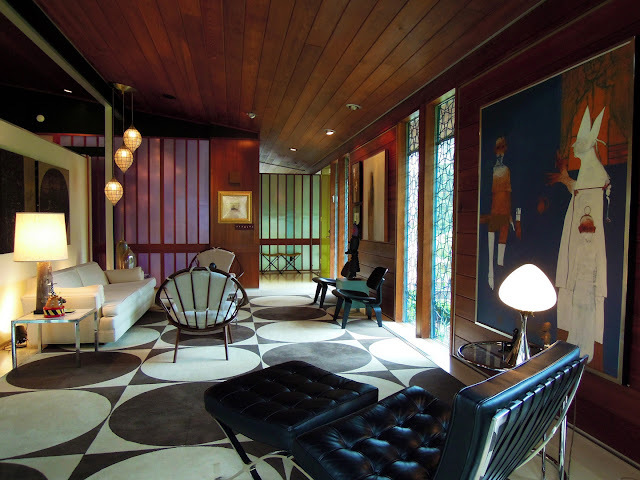 Thanks to the current home-owners restoration efforts, the home has been brought back to its former glory and earned its place on the cover of the Atomic Ranch Midcentury Interiors book published in 2012. Built in 1958, the Alcoa Care-Free Home in St. Louis Park, MN, is also going through renovations, which can be followed on the new home owners' blog "Our Care-Free Home". 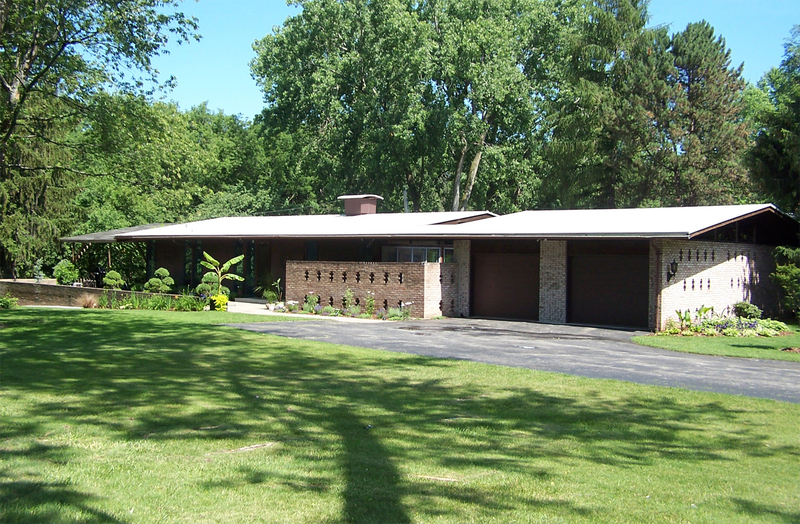 Below are some images of that home. 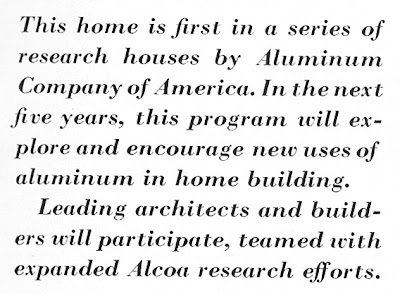 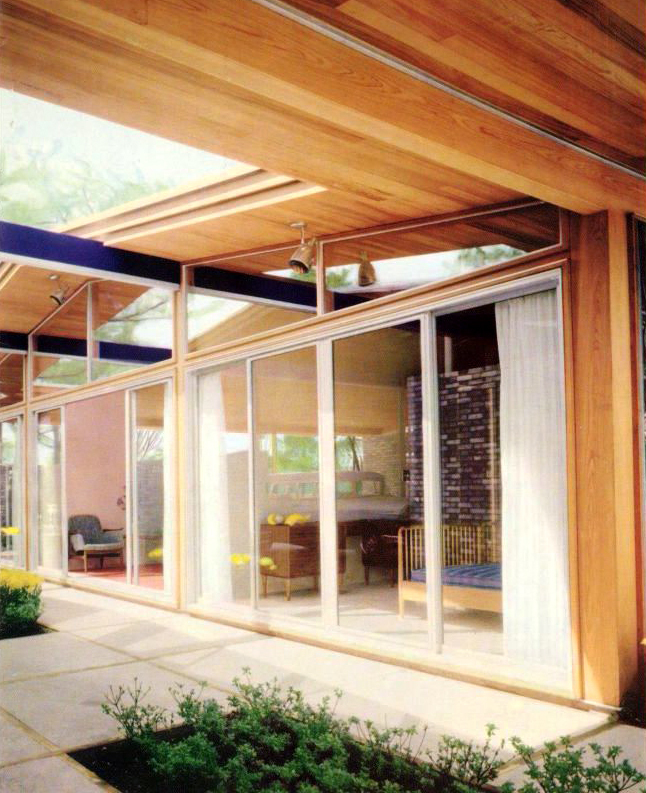 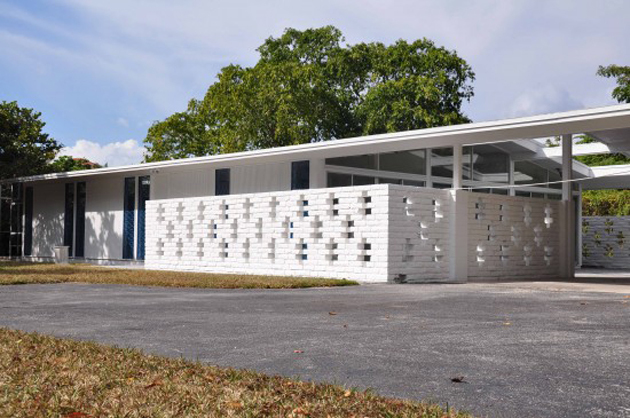 Alcoa also built a model home in Miami, FL. 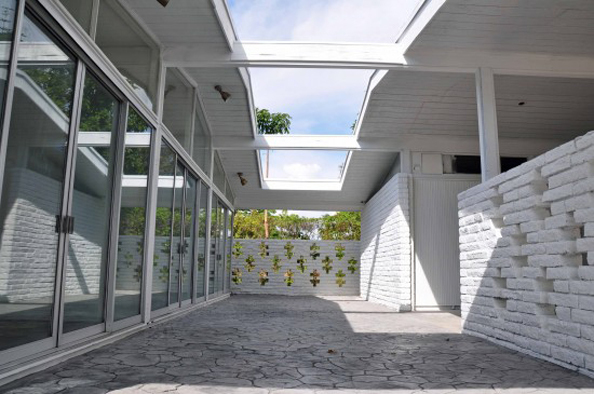 Read the original 1957 newspaper article about it here. 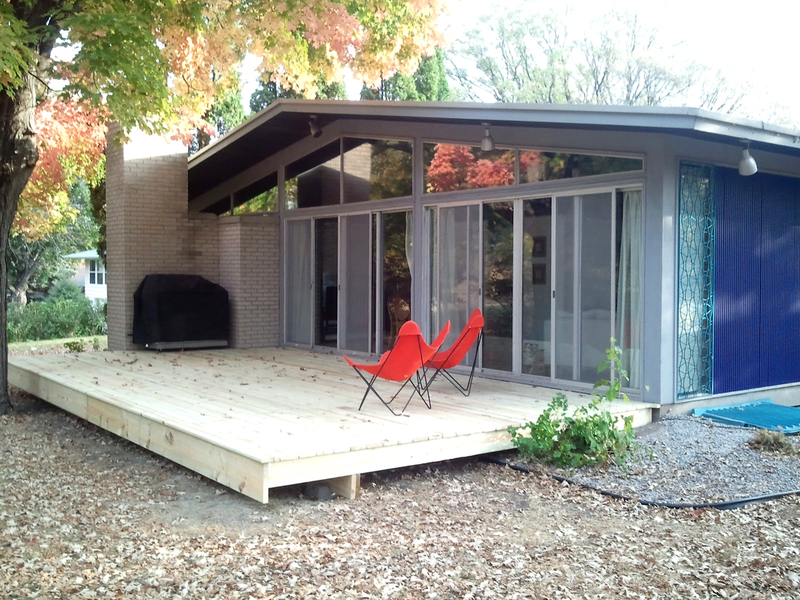 Below are some photos of the property posted on Modern Capital; see the rest here. 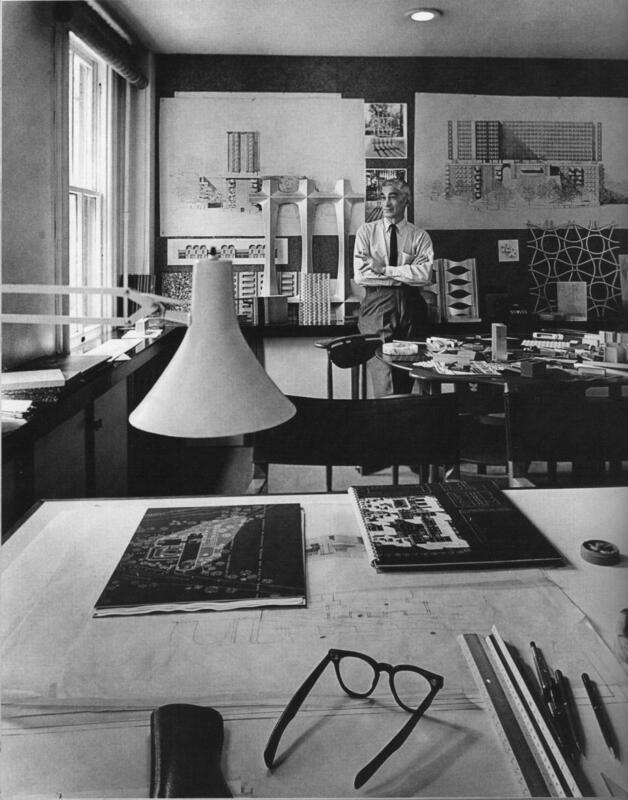 Alcoa Care-Free Home architect Charles M. Goodman in his office; note the trademark woven window grille from the Alcoa homes leaning against the wall on the right. 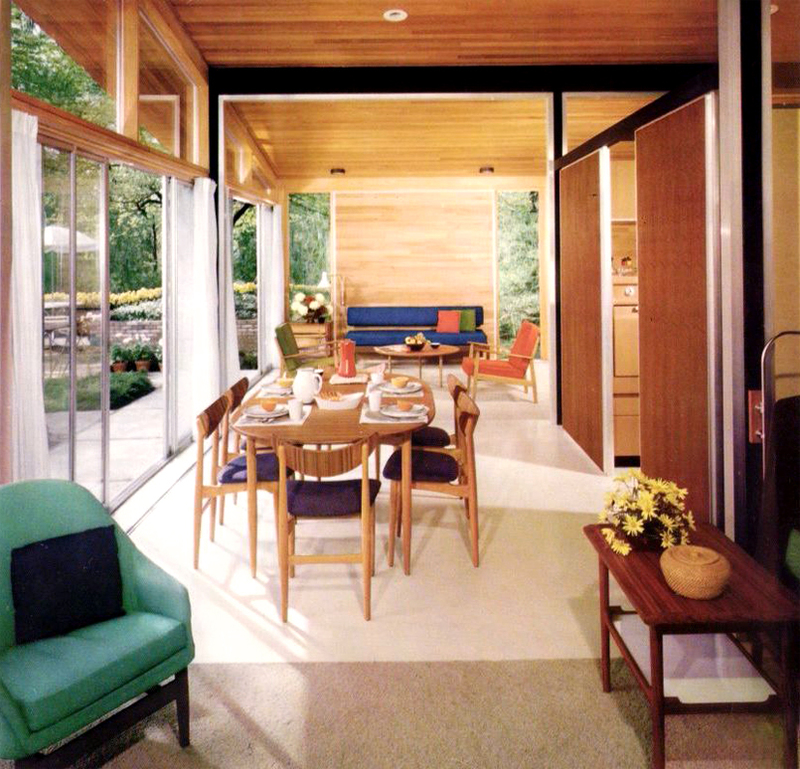 Image courtesy Dwell Magazine. 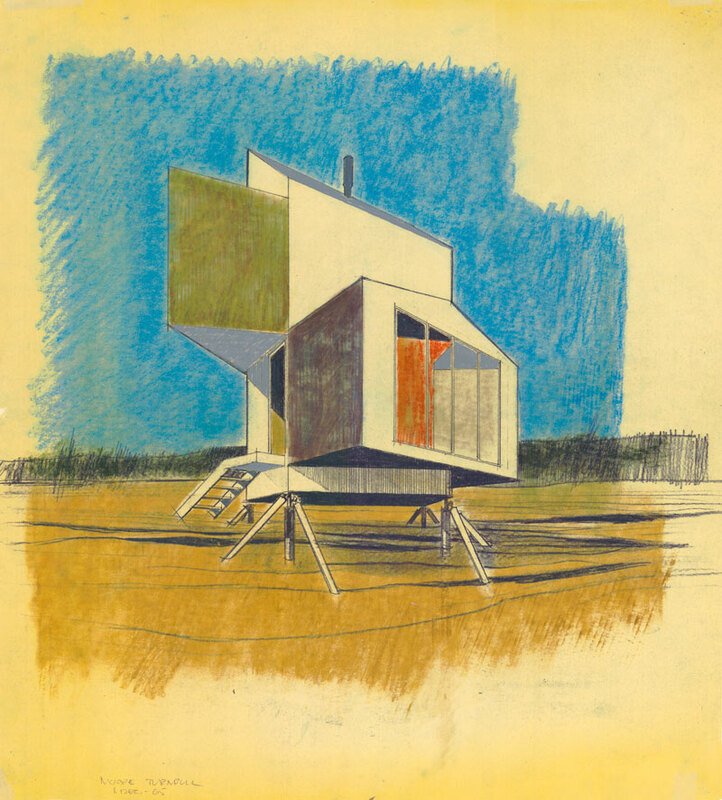 On a related subject- Alcoa was also looking to get into the prefab house market and and chose five architects to submit design proposals. The sketch above was by Charles W. Moore and William Turnbill. 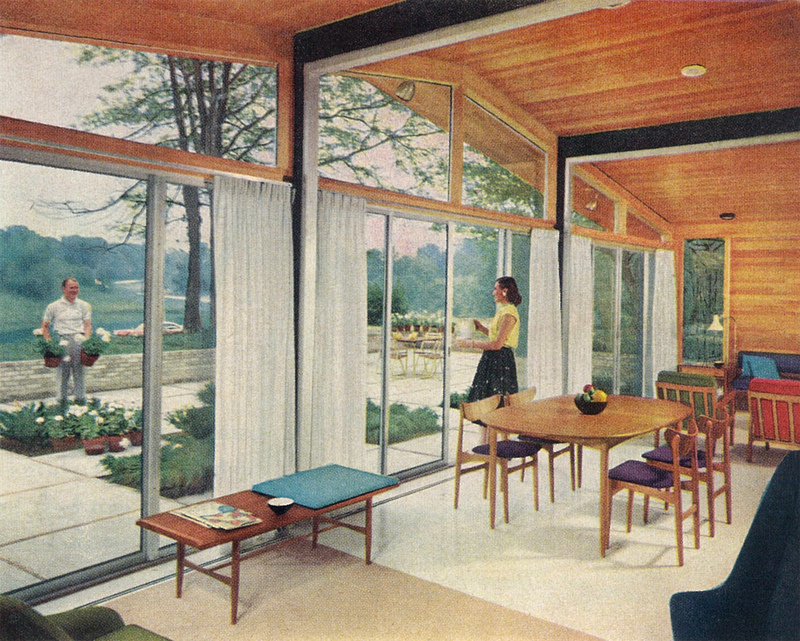 You can read more about this here. thank you, this was a wonderful article! 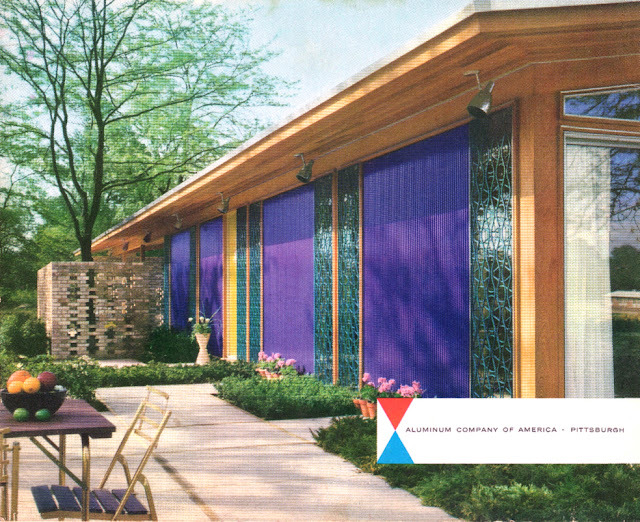 Great blog post and thanks for sharing this piece of history! 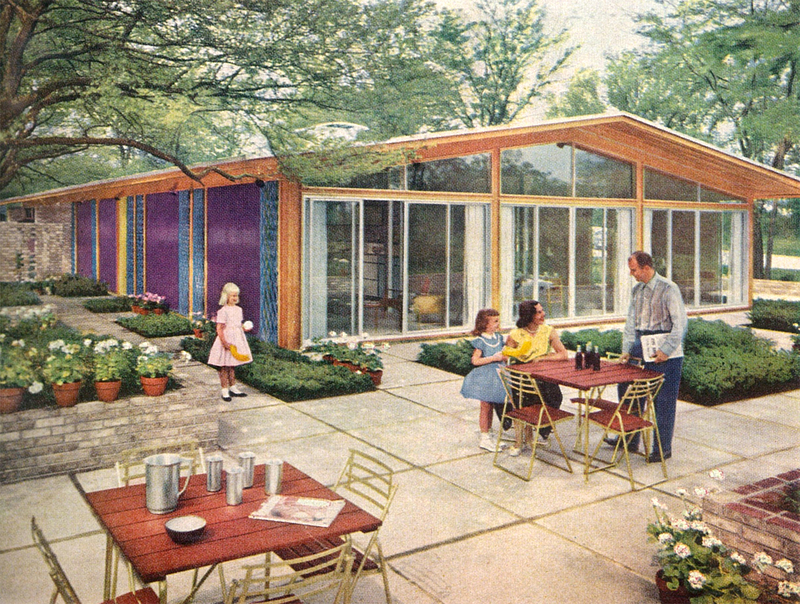 This is amazing you have great images of these wonderful homes, They are just as fabulous today as they were back then! 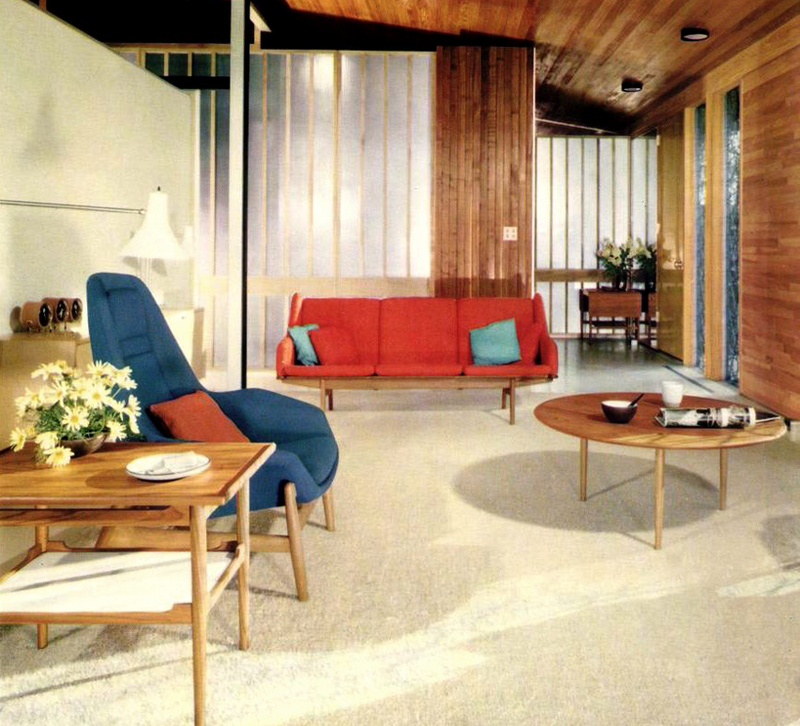 I have Pinned you!